LONG TERM RELATIONSHIPS TIPS...OH THE STRUGGLE! It's easy to mix up Long Distance Relationships with Long Term Relationships...very easy. 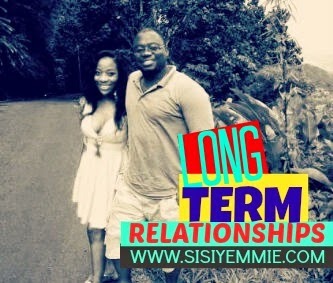 Long Term is dating for donkey years before finally officially tying the knot. It can be very frustrating and risky for both parties but especially women. I should be able to have a conversation about LTR because, errrrr I have been in one for 11 years now. Please don't ask me how come, even me I don't know, I just found myself in 2014...lol. You have to always reaffirm commitment oh, ask each other , "bia, where is this relationship headed"...you can never ask it enough. This is just so you clarify your commitment: it is horrible when one partner is just strung along. Ask questions, make sure you're both on the same page at each turn. Don't assume. Not every relationship works but we all hope from the start that it does: in a long term relationship that isn't marriage, it might be helpful to keep an open mind. Don't psyche yourself that it is you and that person together forever ti ti lai lai. On the other hand keeping an open mind does not mean cheating...it can be tricky to find a balance. Go on dates, travel to new places, engage in invigorating activities together, these are the things that build a relationship : those shared experiences. Long Term Relationships can get boring otherwise, I think this should apply to married couples too. Do exciting things TOGETHER, have fun TOGETHER. You can easily take one another for granted in a LTR, after all you think you know everything about them now and see finish tends to step in (sometimes). Please don't see each other finish, don't allow yourself to be "seen finish". Don't disrespect each other: appreciate your relationship. The butterfly stages would pass if you're in a really long term relationship: it takes conscious effort to keep the sparks flying. The beauty of a new relationship is in the "gish gish" intoxicating feeling, the beauty of a long term relationship is the comfort of familiarity. Would you like to share your tips? Thank you for always reading, I'd love to hear from you! Yesso, Sisi, this is a very good convo. I was in one for 6years and nah one chance i enter...I guess i was on page 90 while my bobo was still on page 59 going on 60. When story started to change last year, i decided to talk to my legs...It is well. Never again sha will i date someone that is so undecided about his future. I've tried to fix it, is it better now? Hi Sisi Yemmie. I'm a first time 'commenter' here. I agree with your tips, no other way to summarize it up. I also think prayer should be added to tips especially if the partners believe in God. By the way, congrats on your wedding win. I screamed out loud in excitement when I heard you won! "I AM DEEPLY OFFENDED BY THE BRIDE PRICE APP!" MONDAY CHIT CHAT : WARRI !!! HAVE YOU VISITED THE BEAUTY KINK ONLINE STORE? KOBIS LAGOS FAST FOOD REVIEW!